The bottom section of the skirt is worked from side to side in one piece. Yarn is then joined to the top edge so the yoke section can be worked from the hip up to the waist. When seaming the bottom panel, begin at the top of the skirt and work downward stopping 5-6″ (10-13 cm) before the bottom edge to form the slit opening. 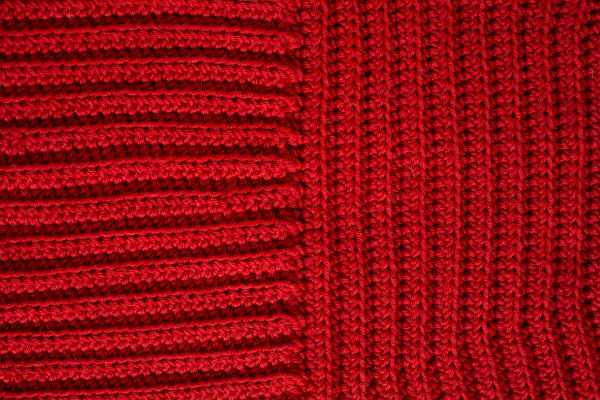 Use a slip stitch seam worked on the right side of the garment to mimic the lines created by the ribbed fabric. Before joining yarn to top edge of skirt to work the yoke, align seam/slit to sit at the center of the left knee (approximately 5-6″ or [13-15 cm] to the left of the front center point). For best results, try on the skirt to double check placement. Chain 73 (73, 73, 74, 74, 76, 76, 77, 77, 78). Row 1 (RS): Hdc in 3rd ch from hook and in each ch across, turn. Row 2 (WS): Ch 2, hdc-BL in first hdc and each hdc across, turn. Align bottom section of skirt so that slit opening is in desired location at left front knee. (See pattern notes.) Then with RS facing, join yarn to top edge of skirt at the center back and ch 2. Work 150, (160, 168, 178, 188, 198, 208, 218, 226, 236) hdc evenly around the piece, turn. Mark locations for decreases: Ch 2, hdc-BL in first st and in each st across while placing markers on indicated stitches. Next row (Dec row): Ch 2, hdc-BL in first st and each st until first marker. Complete st and replace marker. Work hdc-BL-dec over next 2 sts, cont evenly until 2 sts before 2nd marker then work another hdc-BL-dec. Work 2nd marked st and replace marker, then work evenly to 3rd marker. Work 3rd marked st and replace marker then work hdc-BL-dec in next 2 sts. Work evenly until 2 sts before 4th marked st and work last hdc-BL-dec. Work 4th marked st and replace marker then cont evenly across, turn. Next row: Ch 2, hdc-BL in first st and in each st across, turn. Cont in est patt rep these 2 rows 11 more times until 102 (112, 120, 130, 140, 150, 160, 170, 178, 188) sts rem. Ch 1, sc in first hdc and in each hdc across, then work 4 more rows evenly in Single Crochet st.
Next row: Ch 1, sc-FL in first sc and in each sc across, then work 4 more rows evenly in Single Crochet st. Fasten off leaving long tail for seaming. Lightly block garment to finished dimensions. Cut elastic to desired length (usually 2-3″ or [5-8 cm] shorter than actual waist measurement.) Insert elastic into waistband casing and seam casing. Overlap elastic by ½” or [1 cm] and sew securely, then seam center back opening. Weave in ends. Thanks for your comment! We appreciate the suggestion and definitely have plans to update our patterns with yarn weight information. It’s a great idea!